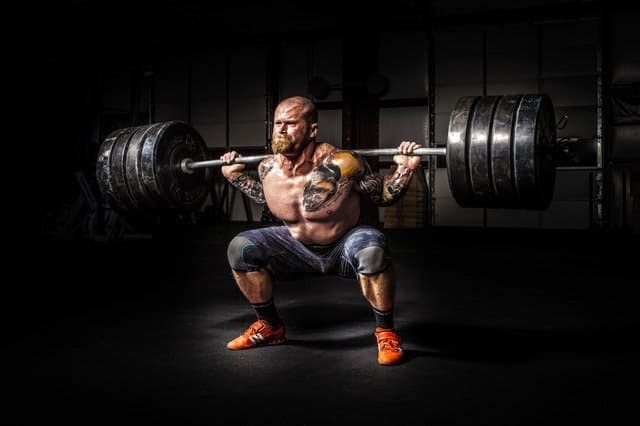 Fitness fads come and go, but the fundamentals of strength training never change. If you want to make real and lasting gains in strength and muscle, the single most effective way is to utilize the main compound exercises. 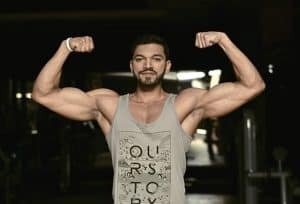 Bench presses, deadlifts, pullups, dips, and squats (commonly called ‘the king of exercises’) are unrivalled in their effectiveness at building muscle and strengthening the body. A good Power Rack (a.k.a ‘power cage’) allows you to safely perform all of these exercises in the comfort and convenience of your home or garage gym (yep, even deadlifts…sort of). 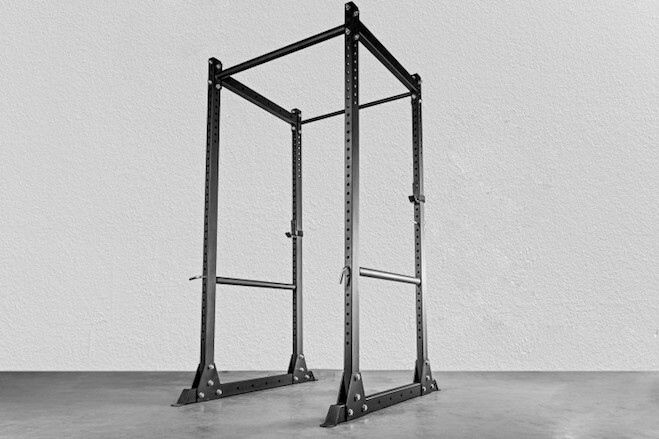 A good quality power cage improves the safety of heavy lifts beyond that of even the best squat racks and stands. Their added stability also increases the functionality and effectiveness of those great bodyweight exercises in pull ups and dips – well beyond that of even the best power towers. 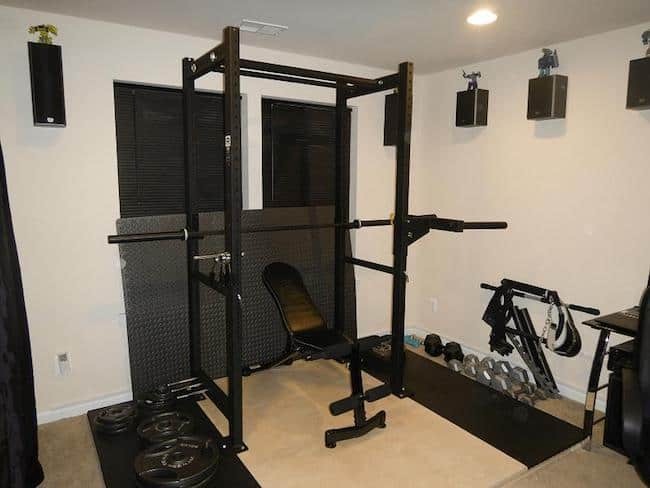 If you have the space and money, then a power rack is without question the greatest addition you can make to your home / garage gym. 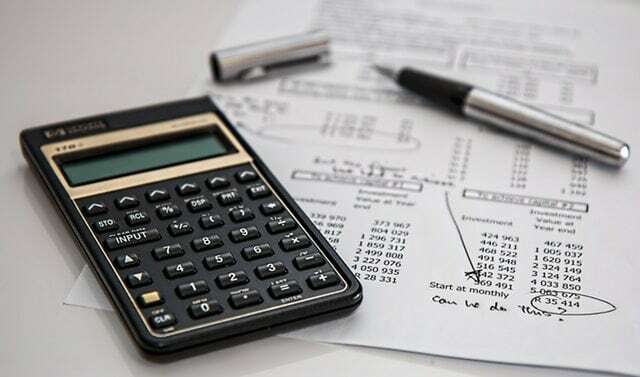 But, a good rack requires a certain outlay of money, and if you’re a normal, sane person, then you’re not going to drop a heap of hard-earned cash on something like that without doing a good amount of research first. 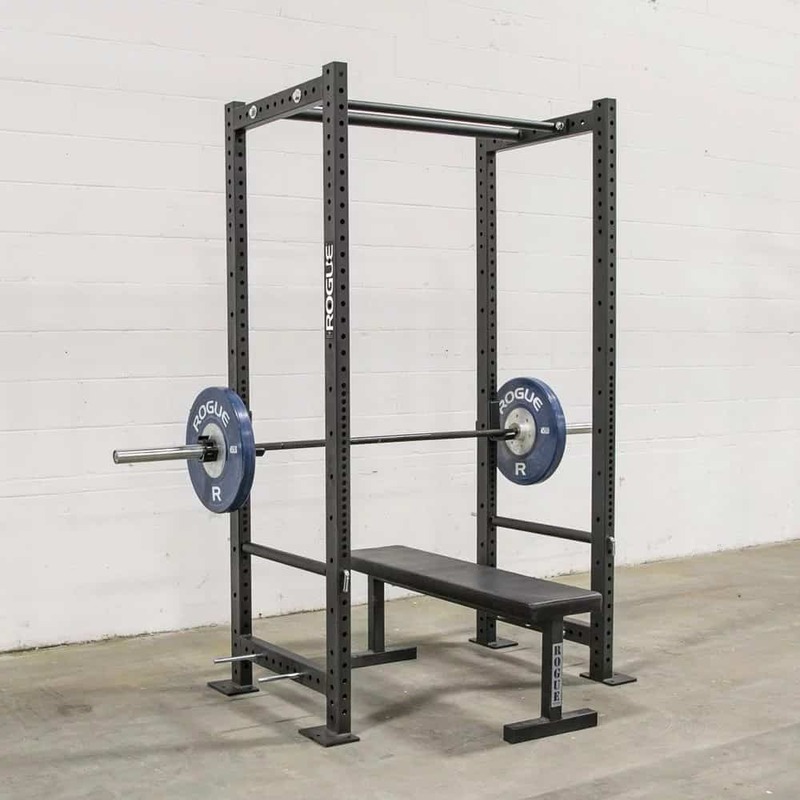 This article will examine 5 of the best power racks and cages for your home or garage gym, and help you make the best possible choice. 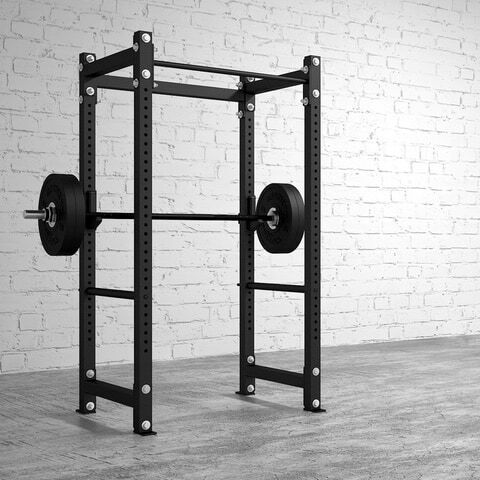 At the end of the article we’ll also discuss some key considerations you need to make when choosing a power rack. Whether you’re just getting into barbell training, or you’re already a passionate and experienced lifter, buying a good power rack will probably be the best investment you can make. On the other hand, buying a crappy rack will likely be the worst. All of the power racks and cages below are worth the money. Which is right for you will depend on how much you’re planning to lift, your budget, the size of your home gym, and any additional personal preferences you might have. If you’re at all familiar with strength training equipment, then you’ll know that Rogue Fitness are the market leaders in terms of quality. 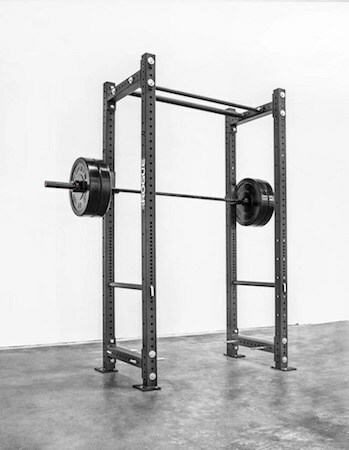 The Rogue R-3 Power Rack is arguably the single best example of that superior quality. 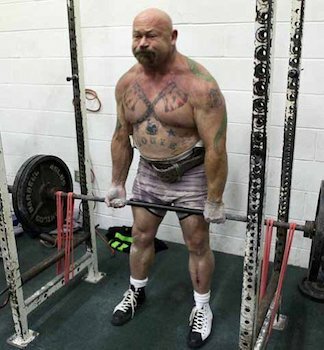 It was designed and built in the mold of the classic power rack used by Louie Simmons in the strength training laboratory that is the gym at Westside Barbell. And like the athletes at Westside, the R-3 Power Rack should help take your powerlifting to the next level. Excellent quality J-Cups with UHMW lining (ultra-high-molecular-weight or simply ‘hard plastic’). Pin and pipe safeties that are far stronger than they look, and have undoubtedly saved more than a few lifters from injury (or death). 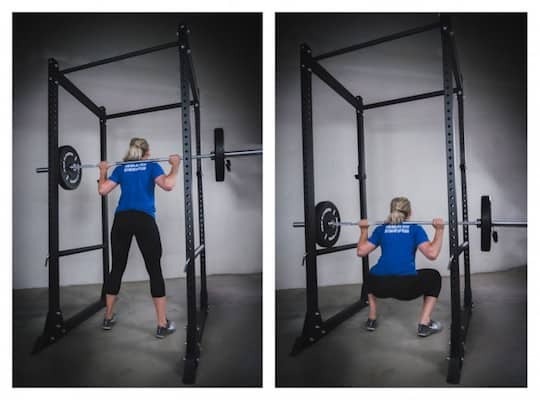 Using the Westside hole spacing that comes standard with most of Rogue’s power racks and squat stands, these safeties can be adjusted to the perfect height for all users through the squat, bench and clean pull ranges. 4 x band pegs, which often cost extra. On the DL, these can be used for storing your bumpers or steel / iron plates until you get a more permanent solution. 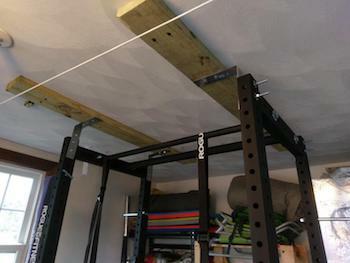 43″ dual Fat/Skinny pullup bar for lat and grip strength. Why did we say almost everything you need to get started straight away, you ask? Well, this power rack must be bolted to the floor for safety. However, Rogue’s concrete anchors need to be purchased separately. They’re not expensive (~$15), but it’s extra cash nonetheless. On that note, if you don’t want to / are unable to drill into your floors, another solid option is to make yourself a plywood platform. If you’re going to do this, then you’ll want to use 3 x ¾” sheets, glued and screwed. We’re going to side with Rogue, and recommend against using it as a freestanding rack. Not only is there risk of it toppling over if it’s not bolted down, but the legs can also splay outwards over time. 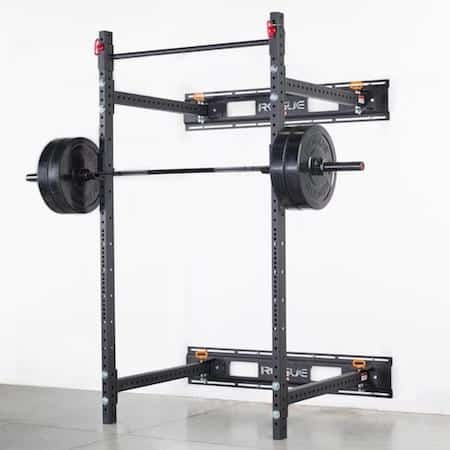 If you want a freestanding variation of the R-3 Power Rack, check out the RML-390F Flat Foot Monster Lite Rack, discussed below. Aside from having to bolt it to the floor, the R-3’s dimensions are its other most often discussed aspect. It has a footprint of 53″ wide x 34″ deep, with a 24″ working depth. This raises concerns for some that it isn’t deep enough to lift comfortably inside of. We’ve found that the 24″ working depth is plenty big enough, and that even the largest of humans are able to lift inside it without issue. Ultimately, it comes down to personal preference, and is just something you’ll have to experience for yourself. The R-3 has a standard height of 90″, meaning it will fit comfortably under 8′ ceilings. If, however, you have lower ceilings, you can get a “shorty”, which has 84″ uprights. 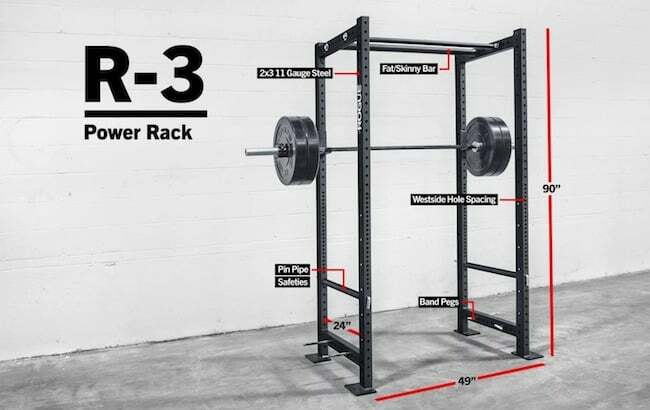 While the standard R-3 is great for anyone looking for a space-saving power rack, the ‘shorty’ is arguably the best compact option available. Due to its incredible versatility, and overwhelming popularity, Rogue have made a number of R-3 variations to ensure that almost anyone, with any need, can enjoy the benefits of lifting inside this power rack. This is the bolt together version of the R-3, which enables it to be more easily manoeuvred through and into tight spaces. It has slightly different dimensions to the standard R-3: It’s 53″ wide, and you get a choice of a 30″ or 24″ working depth. There’s no “shorty” option, and it costs about $30 more. An ultimate space saving option, The R-3W is a clever rack that mounts to the wall and folds flat when not in use. Realistically, it’s actually a squat rack, owing to the fact that there’s no inside working area. It has a few variations itself depending on your needs, and is a great option if you can’t have your rack permanently taking up floor space in your home gym. Note: The R-3W stringers are not included, and cost $50 extra. concerns for safety and stability. This is the bolt-together version of the RML-3 above. It’s identical in every way, except the uprights come flat-packed rather than as single pieces. You can now also get the RML-390C, which is the same bolt-together rack, except it’s available in a range of funky colors. Can’t or won’t drill into your home gym’s floors? The RML-390F is a good solution. It’s self-stabilizing feet allow it to stand on its own, while its size and weight ensure it’s as stable as ever. It has a 30″ working depth like the RML-3, however, the stabilizing feet create a 48″ overall depth. This removes it from the ‘space-saving’ category, but it’s a great rack that’s perfect for people looking to keep their home gym’s floors in tact. This is the absolute king of wall-mount racks. 3×3″ 11-gauge steel uprights, quick attach pullup bar, and locking pin & hinge system make it one of Rogue’s most popular piece of equipment of any type. So, that’s the Rogue R-3 Power Rack in all is versatile, variable glory. We’re guessing that many of you reading this will have been looking at the Rogue R-3 already, but aren’t yet convinced if it’s worth the money…If you’re one of those people, and still wondering if you should press the trigger on this rack: Do it. It’s made in the US to the highest standards of quality and has a lifetime warranty. If you train alone, it’s a great investment that could genuinely save your life. Are you thinking a power rack might be a bit much for your home gym? A good squat rack could be a better option. 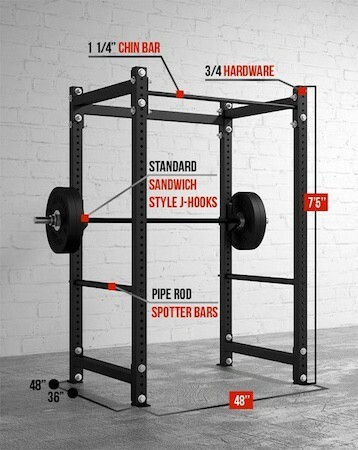 Take a look at the best squat racks and stands currently on the market. For anyone who doesn’t want to pay Rogue’s prices, Rep Fitness is rapidly becoming the best option for home fitness equipment. Their power racks are a great demonstration of this, especially the PR-3000 Power Rack. Using the same basic Westside design as the Rogue R-3 (and most other racks), the PR-3000 is a good quality, hefty power rack at a very reasonable price. 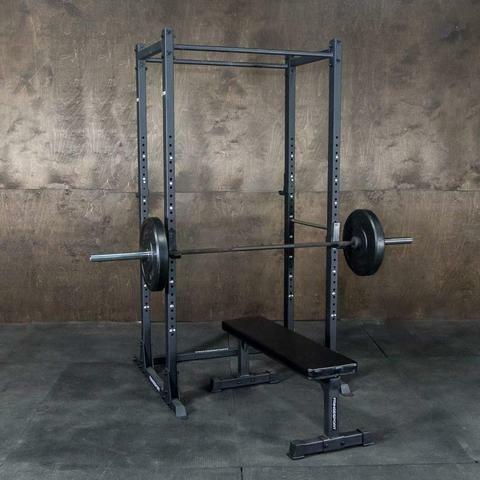 For less than $500 (plus shipping), it’ll make a solid centerpiece for your home or garage gym. 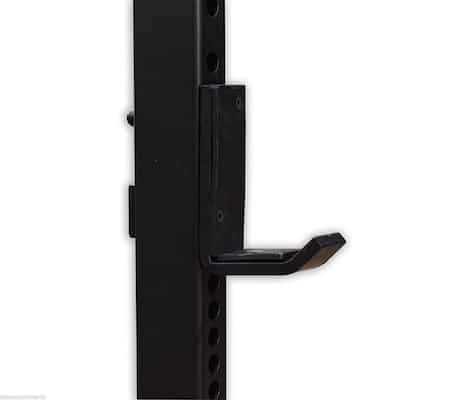 Like the standard Rogue R-3, the Rep PR-3000 is constructed from 2×3″ 11-gauge steel on both uprights and base. Unlike the R-3 however, it has a self-stabilizing, flat-footed design, meaning it doesn’t have to be bolted to the ground. If you’re in a rental, or you simply don’t want to drill into your foundations, this power rack is a good option. That said, you can bolt it to the ground, and if you take this option, the PR-3000 becomes an extremely sturdy and stable power rack. That’s not to say it’s not stable as a freestanding rack: It is. However, bolting your power rack to the floor is always the best way to go if possible. Unfortunately, Rep Fitness doesn’t include mounting screws with the PR-3000. We recommend these Titen HD screws, which are available from most hardware stores. There are some downsides to the PR-3000 too. If you’re looking a for a compact power rack similar to the R-3, this is not it. Its footprint is 48″ wide x 60″ deep, and it’ll take up a fair amount of space in your home gym. That said, the greater size gives it some extra weight (265 lbs.) 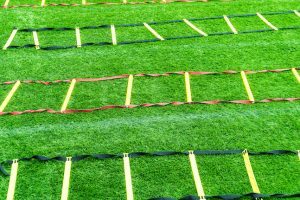 and when combined with the larger footprint, creates more stability and less side-to-side and back-and-forth movement when using the pullup bars. 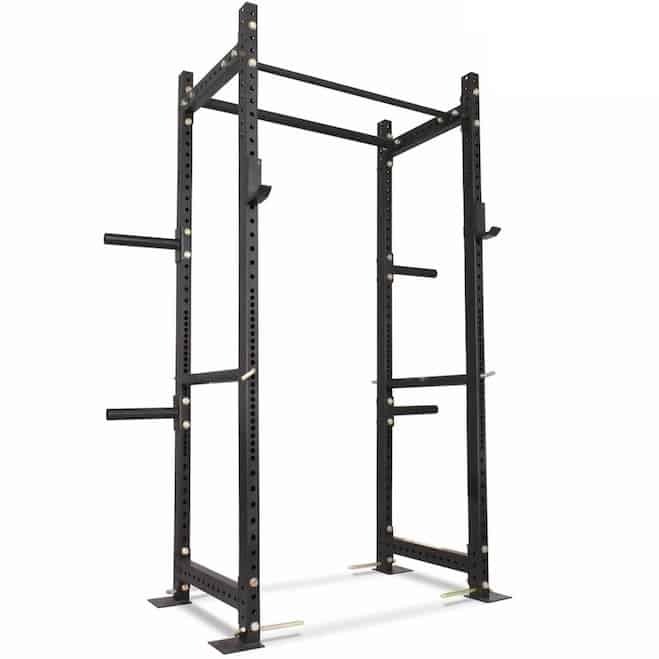 It also produces a working depth of 36″, meaning you’ll have plenty of room to move when lifting inside the rack. Despite the usefulness of the Westside hole spacing that is standard on most Rogue racks and rigs, it hasn’t been widely adopted by competitors, including Rep Fitness. The PR-3000 has 2″ hole spacing the entire length of the uprights, meaning you may not be able to find that sweet spot for the safeties in the bench range. The PR-3000 is also a shade taller than most comparable power racks. At 93″ tall, it’ll barely fit under 8′ ceilings. Fortunately, there’s a shorter variation available, the PR-3050, which is 83″ tall and should be perfect if your home gym has lower ceilings. All-in-all, the Rep Fitness PR-3000 Power Rack is very good lower cost option that does its job, and will free up some extra cash, which you can use to keep fitting out your home / garage gym. 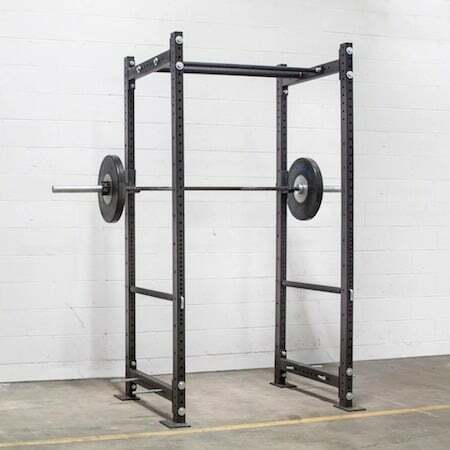 Yes, it’s made in China, so it simply can’t meet the same standards of manufacturing quality that the Rogue power racks can, but if budget is your main concern, then you’ll be hard pressed to find a better power rack. Titan Fitness make no secret of the fact that the T-3 Series Power Rack is a near-identical clone of the Rogue R-3. 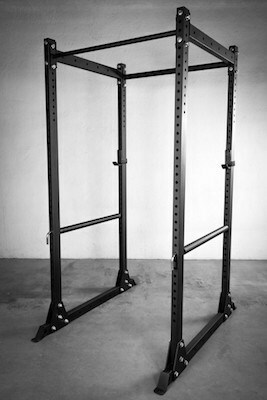 Indeed, one of the biggest differences between the two racks is the cost: The T-3 is less than half the price of the R-3! Although it’s a blatant copy, it’s also a very solid option if you like the look and features of the R-3, but can’t or won’t shell out the extra cash for it. Like Rep Fitness, Titan target the budget-conscious segment of the home fitness equipment market, and are currently the major player in this segment. 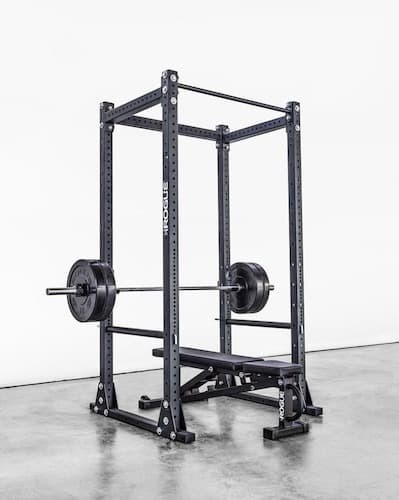 Therefore, while its certainly necessary to compare the T-3 to the R-3, it’s also worth comparing it to the Rep Fitness PR-3000, which is the only other sub-$500 power rack worth looking at (depending on your needs, of course). Weight 230 lbs. ~250 lbs. 265 lbs. First, the T-3’s rubber-lined J-Cups are pretty crappy, and nowhere near as good as the UHMW-lined J-Cups that come with the Rogue and Rep power racks. Second, the T-3’s paint job leaves quite a bit to be desired. The R-3 and PR-3000 are both powder-coated, however the T-3 appears to be spray-painted. If looks aren’t important to you, then no problems, but those who do like a nice finish to their expensive purchases will likely be disappointed with the T-3’s color. Additionally, something you can’t glean from a specs list comparison is differences in the quality of the manufacturing / construction. Rogue’s power racks are US-made; they’re manufactured in Columbus, Ohio. Each component is inspected individually throughout the manufacturing process, and again before the rack actually ships. Manufacturing defects are extremely rare in all of Rogue’s products, and they guarantee their products for life. The T-3 and PR-3000, on the other hand, are made in China, and generally don’t go through the same strict, quality-controlled manufacturing process. This means that the construction can sometimes leave a bit to be desired; defects are more common and more serious, and the warranties are limited (usually 1 year). Unfortunately, T-3 power racks seem to have more issues than the PR-3000 and other low-cost options. 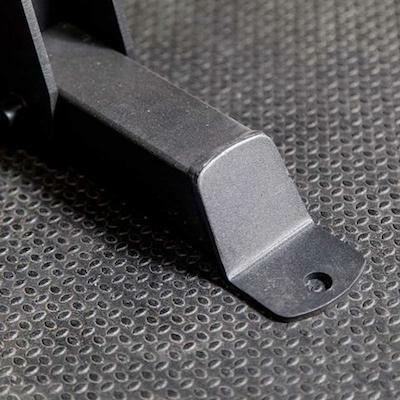 While these problems aren’t common and most T-3 racks work as expected straight out of the box, you may encounter things like bowed uprights, incomplete and messy welds, misaligned and badly pressed holes, and non-threaded bolts. If you’re unlucky enough to experience them, issues like these are certainly annoying, however they’re part and parcel of low-cost fitness equipment. If you want the highest quality, you simply have to pay for it. In any case, manufacturing defects can usually be remedied by reaching out to the Titan Fitness customer service department. By all reports they’re very helpful and they quick to send out replacement parts. Let’s not focus too much on uncommon problems. As we said, the vast majority of the time the T-3 Series Power Rack will arrive defect-free, and when it does it’s a good piece of equipment. With a 1000 lb. capacity on the spotters, even serious lifters should feel comfortable performing most power lifts inside a T-3. This is especially true for bench presses, as it’s one of the only common power racks other than the Rogues that has Westside hole spacing through the bench range. Like the R-3, the T-3 has a compact footprint, making it very suitable for home / garage gyms in which space is at a premium. Also, the included storage horns are a nice touch and when loaded up with bumpers or weight plates, make it even more sturdy than normal. Overall, it’s not perfect but it’ll do its job without burning a hole in your pocket. If you’re a lifter who wants to train at home on a budget, then the T-3 Series Power Rack is definitely worth considering. Like the R-3 it has a working depth of 24″. As we mentioned before, this may not seem like much, but once you give it a try you ‘ll see that it’s actually plenty. Like the PR-3000 it has flat feet, which allow it to be a freestanding rack if you want to protect your home gym’s floors. Again, like the PR-3000, it’s feet has pre-drilled holes that allow you to bolt it to the ground if you so desire. Somewhat uniquely, the Kip Cage’s feet extend well beyond the upright joins (it has a total footprint of 45″ deep x 47″ wide). As Fringe Sport have done in the video below, as well as a number of other buyers, this allows you to place sandbags on the feet to give it extra weight and stability. Considering 50 lb. sandbags are usually only about $5 a pop from hardware stores, this is an effective low cost alternative to bolting it to the floor. A solid option for anyone concerned about both the sturdiness of their power rack and the irreparable damage done to floors by drilling into them. The trade-off for the extended feet, however, is that this power rack is going to take up a bit of extra floor space in your home gym. Certainly not as much as the Rep PR-3000, but more than the R-3 and other bolt-down racks. On the plus side, it’s 91″ tall, so even under 8′ ceilings it should have plenty of clearance above the pull-up bars. The Kip Cage has a final couple of little unique features worth mentioning. First, it comes with two pairs of UHMW-lined J-hooks so you can have two squat positions simultaneously (i.e., no need to make adjustments). Second, the holes on the uprights are numbered, which allows for quick and easy adjustment of your J-cups and safeties. Unfortunately, Fringe Sport is another one of those Rogue competitors that is yet to adopt the Westside hole spacing. Like most other power racks, they have 2″ spacing the entire length of the uprights, so again, you might not be able to find that sweet spot for the safeties through your bench range. Fringe Sport offers free shipping on all of their products, however the reality is that neither UPS, nor any other freight company, ship stuff for free. Therefore, “free shipping” really just means shipping is included in the price. Nevertheless, the Kip Cage is a good quality, functional, and sturdy power cage. It’s usually more expensive than the T-3 or PR-3000 racks, however Fringe often do sales on their equipment, so if you can get one of these power cages for less than about $650, then you will have done pretty well. American Barbell’s mission is to provide premium products that give the greatest opportunity for success to all of their customers, and the Mammoth Power Racks are proof that they’re doing a damn good job in achieving that mission. Like most of AB’s range of power racks and squat stands, each of the Mammoth Racks are designed and manufactured to specifications that are not typically met in the exercise equipment industry (except by Rogue), and they’re meant to stand the test of time. While they are even pricier than Rogue’s equipment, they are almost unrivalled in their strength and sturdiness. 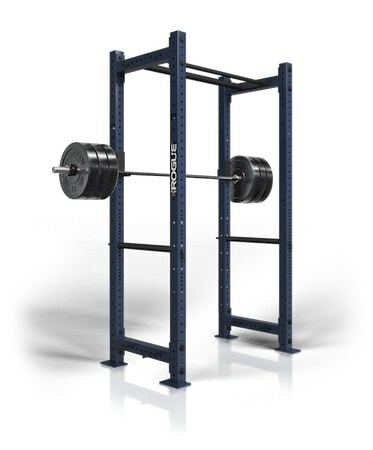 All 3 racks are very similar to the bolt-together Rogue RML-390BT Monster Lite Power Rack. Like the RML-390BT, they use black powder-coated, 3×3″ 11-gauge steel uprights and base, which makes them very heavy (~300 lbs. ), and very sturdy. American Barbell use thicker ¾” bolts to keep the things together, as opposed to Rogue’s 5/8″ hardware. Like many good quality power racks, the Mammoth Racks must be bolted to the floor to ensure safety and comply with AB’s lifetime warranty conditions. Unfortunately, there’s no freestanding variation. The 3 Mammoth racks are more similar than they are different with their size and footprint primarily being what sets them apart. 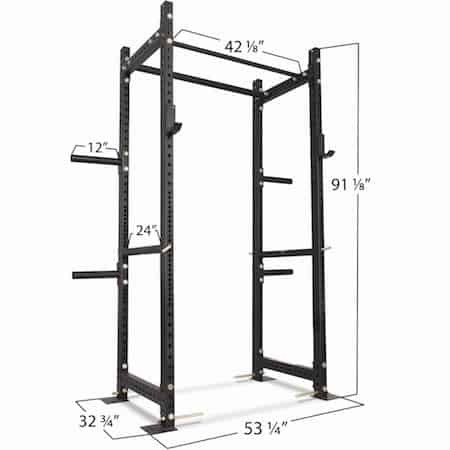 Deciding which rack is right for you will depend on how much working depth and height you want. 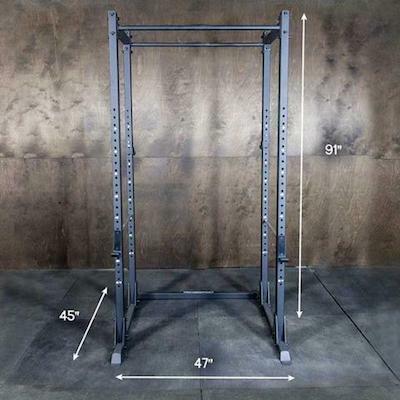 The Mammoth Rack 36 has a 36″ deep x 48″ wide footprint, while the Mammoth Rack 48 has a 48″ deep x 48″ wide footprint. Both are 89″ tall, meaning they’ll fit under 8′ ceilings, but probably not sub-8′ ceilings. The Mammoth Single Rack is the premium variation. It has a 48″ deep x 48″ wide footprint, and stands a lofty 96″ tall. It also includes wooden gymnastic rings for all you calisthenics buffs, and the lower cross braces accept band pegs for banded lifts. As you can see, none of the Mammoth racks can be considered particularly compact. Then again, if you’re really short on space, you may want to consider a good squat rack or stand, rather than a full power rack. 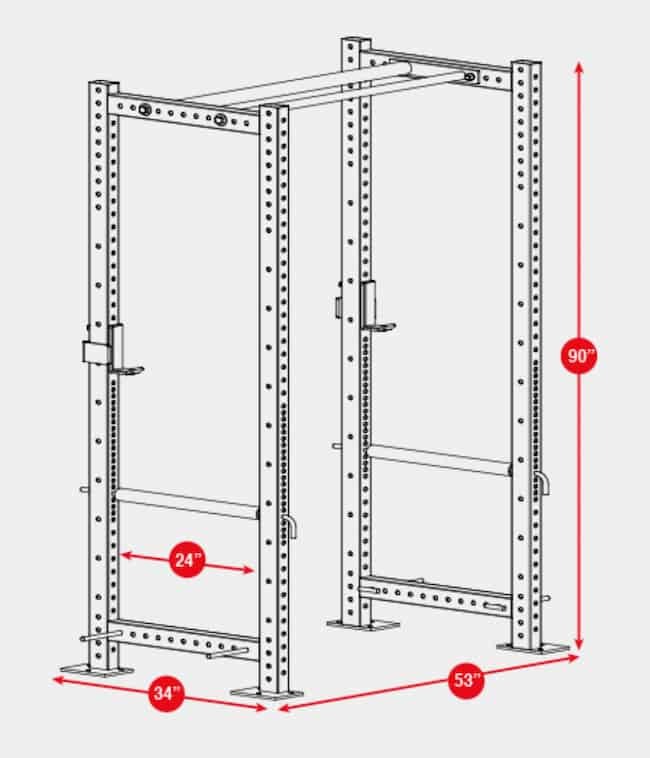 All racks include sandwich style, UHMW lined J-hooks and a single 1.25″ pullup bar. Unfortunately, American Barbell don’t provide concrete screws for bolting their racks to the ground. We recommend these Titen HD 3/8 x 3.5″ screws. 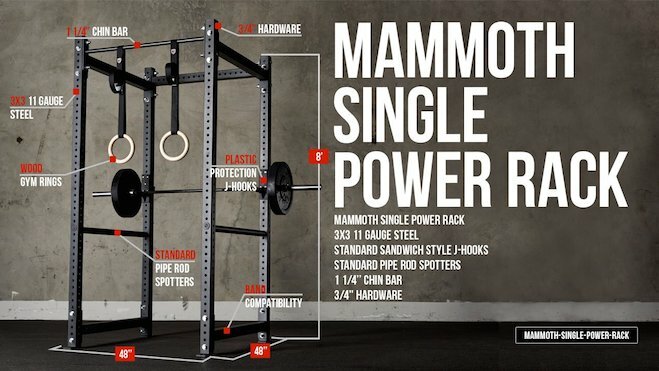 As mentioned earlier, the Mammoth Power Racks, like almost all American Barbell equipment, are expensive. And, what makes them even more expensive is the fact that the pin and pipe safeties are not included. The images on the website suggest they are included, but don’t be fooled; they must be purchased separately, and cost about $100. That takes the total for the cheapest Mammoth Rack 36 to almost $1000 plus shipping. With spotters, the premium Mammoth Single Rack is over $1200 plus shipping. For many people these prices are deal-breakers, and we can absolutely understand that. So, why would you purchase one over a Rogue? Well, we think it comes down to size. The Mammoth Rack 48 and Mammoth Single Rack both have roughly 42″ working depths. The R-3 and most of its variations only have 24″ working depths. If you’re concerned about how much room you have inside your power rack, and want to make sure you have plenty, then the Mammoth Rack 48 or Single Rack are your best bets. **If you’re thinking about the Mammoth Rack 36, then stop. You’re much better off going with the Rogue RML-390BT with 30″ depth. It’s as good or better than the Mammoth Rack 36 for $100+ less. So, in the end, the Mammoth Racks will really hit your hip pocket, which is why they’re not higher up on the list. But, they’re also extremely strong and reliable, and have larger working depths than most of the alternatives, making them very appropriate for those who need the extra room while pushing their lifting limits. If we were going to be dumping (not placing) 300+ lb. 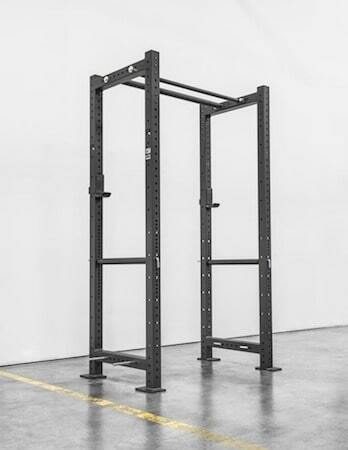 lifts onto a rack, the Rogue R-3s and these American Barbell Mammoth Racks are the only ones we’re truly confident would be able to withstand it time and time again. More often than not, your power rack will be the centrepiece of your home or garage gym. They’re the most versatile and effective support equipment ever created for strength training. But they aren’t cheap. Even the lower cost racks can be a hit to the bank account. Odds are that if you’re reading this article with serious intentions of buying a rack, you’ve already done a lot of agonizing over which is the right one for you. Hell, you may have spent the last 12 months researching everything you need to know to make the best decision! 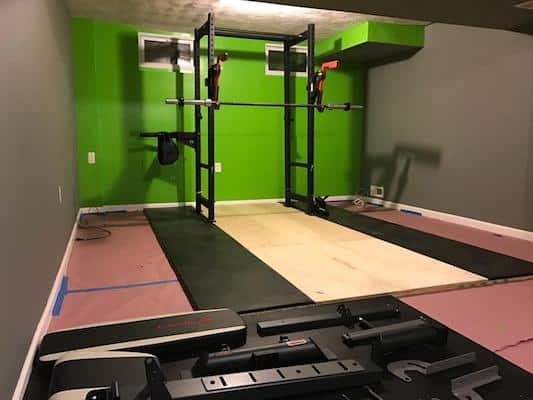 Nevertheless, we’ll quickly run through some of the primary considerations to make before pulling the trigger on a rack for your home or garage gym. 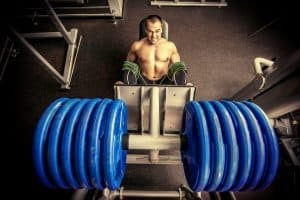 How much are you planning to lift? When shopping for a power rack, this is the first question you should be asking yourself. Your answer can and should influence the decisions you make around the considerations that follow. 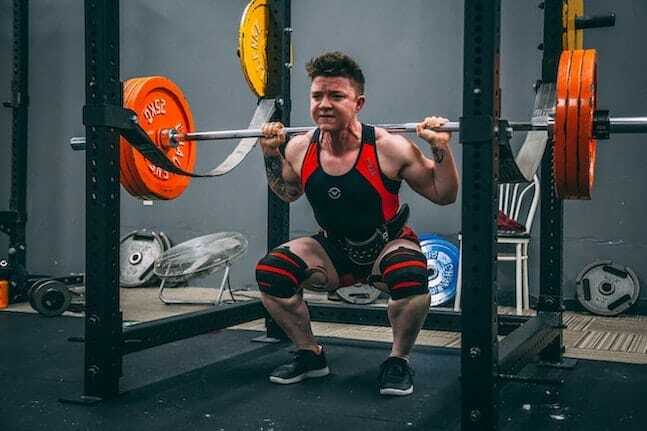 If you’re planning to lift heavy and really push your limits, whether in the short- or long-term, then you’re going to need a different piece of equipment than if you’re planning to lift well within your 1 rep max (1RM). If your back squat is getting up into the 300+ lb. range, and you have a tendency to get stuck in the hole, then you’re definitely going to want to go with something more heavy duty and higher quality. Why? Because bailing on a lift, and dropping a 300+ lb. bar onto your rack generates a helluva lot more force than lowering it in a controlled fashion. Pretty much any power rack can handle static weight, that’s not the issue. It’s the applied force behind failed weights that necessitate a rack with a better design and higher quality construction that won’t shear or bend. The Rogue R-3 and it’s Monster Lite variant, as well as the American Barbell Mammoth Racks are perfect for safely pushing your lifting limits at home. They’ll fit your needs now, and provide plenty of room for you to grow into. The PR-3000, T-3 Series and Kip Cage are all more than adequate if you’re going to be lifting well within your 1RM, now and into the future (assuming that’s considerably less than 300 lbs.). This is a bit of a no-brainer, but price does to be one of the first and most important factors in deciding which power rack to go with. If you’ve got the cash spare, then going with higher quality equipment is almost always the right decision, even if you’ll be lifting well within your 1RM. As we say in nearly every review we do, you get what you pay for when it comes to fitness equipment. 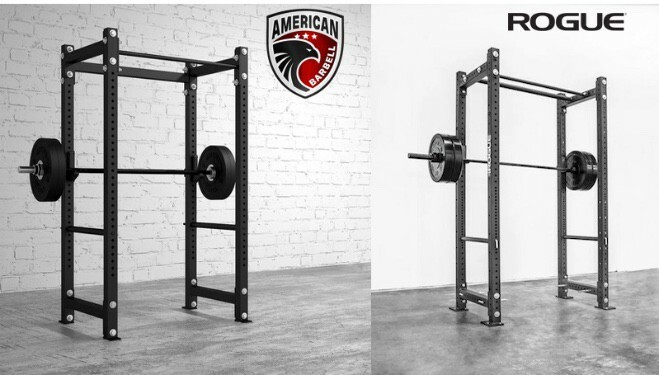 The Rogue and American Barbell racks are pricey, but they’re the best quality overall. The PR-3000 strikes a very nice balance between affordability and quality, as does the OneFitWonder Kip Cage. 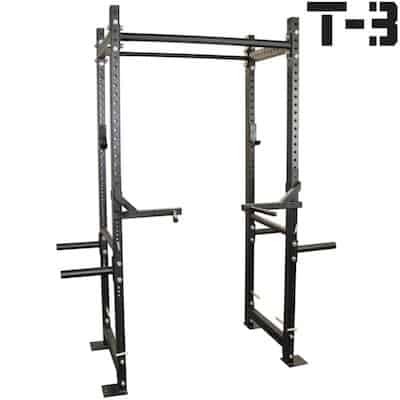 The T-3 Power Rack from Titan is very very affordable, but it comes with a higher risk of defects. How much space do you have in your home / garage gym? As far as the 5 power racks above are concerned, this consideration will very quickly determine whether they’re suitable for you or not. 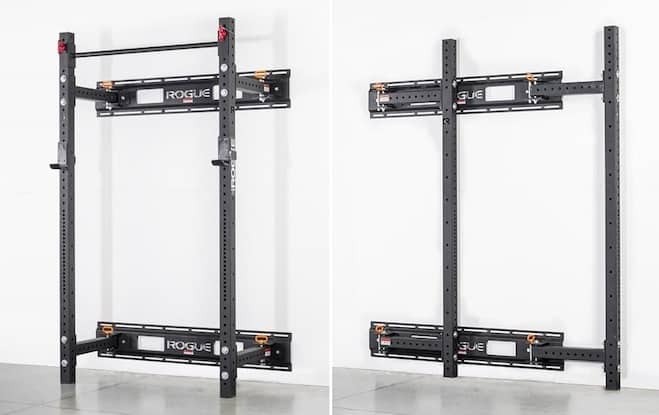 If you don’t have an abundance of space for your rack, then the PR-3000, with it’s whopping 48″ wide x 60″ deep footprint, is probably not going to be the one for you. The R-3 and T-3 racks, on the other hand, are much more compact, especially in terms of depth (34″ and 32″ respectively). They’re your best bets if you’re looking for space-savers. The other racks fall somewhere in the middle. Another thing to consider is obviously ceiling height. 8′ ceilings are about the lowest you’ll be able to work comfortably with, and even then you might be pushing it with some of these racks. Bear in mind that you’re going to need at least 6″ – 12″ clearance above your pullup bar if you’re going to be using it a lot. 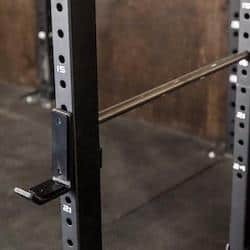 You can go with the shorter racks, or move your pullup bar(s) down a notch, but if you’re on the taller side this will force you to bend your legs considerably when doing pulls. 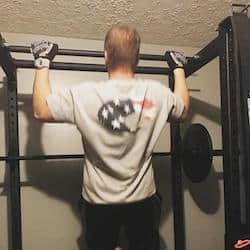 If you do find that your home gym just doesn’t have the necessary space for a full power rack, then a good quality squat rack or stand is a legit alternative. Well, there it is: 5 of the best power racks for your home or garage gym. 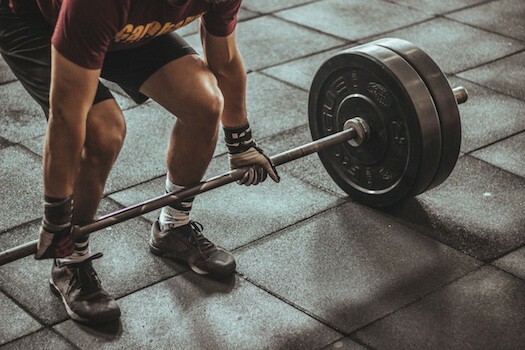 No matter your lifting goals, budget or space-restrictions, you should be able to find the equipment you need to take your strength training to the next level. And take it to the next level you will. A good power rack is, without question, the most valuable addition you can make to your home gym. It is the furnace in which the strongest version of you can be forged. As always, best of luck with your home workouts. Remember: When it comes to working out, we can make the effort or make excuses, but we can’t make both.